Grading old silver dollars is a process of examining and judging specific areas on the coin. Comparing to standards of wear typical of each grade; determine condition of the coin. Silver dollars are valued in tiers, often with a wide difference from one grade to the next higher. Conservative grading is important. Optimistic grading often leads to a false understanding of how much the coin is worth. Involved in the grading process is close attention to subtle detail. 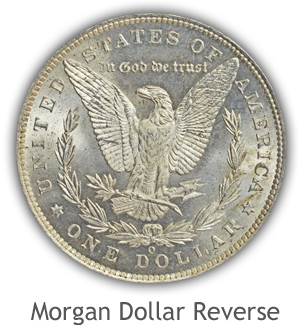 In the above image is the reverse of a Morgan dollar. Wear has removed a small amount of the highest points of metal. However enough detail remains to place the coin in the Extremely Fine grade. Inspect the center of the eagle and out-stretched wing. Noted is the remaining presence of small delicate design elements still visible on both. Overall eye appeal is good and condition of the coin is only slightly affected by wear. Follow the videos and your eyes become accustomed to detecting small differences to the surface of these coins. 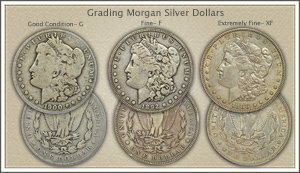 Morgan Silver Dollars: Grade Morgan silver dollars by following the video through the grading process. Elements of wear are examined and compared to examples of grade. Images highlight areas to judge and descriptions give insight into the subtle points needed to accurately grade. Visual appeal is also considered. Collectors seek coins of charter to add to their collections. Certain "looks" add charm to these old dollars, absents of marks is also considered. Peace Silver Dollars: Peace silver dollars require judging subtle factors to the surface to arrive at an accurate grade. Within the video, grading difference are examined and judged to separate the different grades. Images are enlarged to view these small details and descriptions highlight the areas to focus attention. All silver dollars have a base silver value. 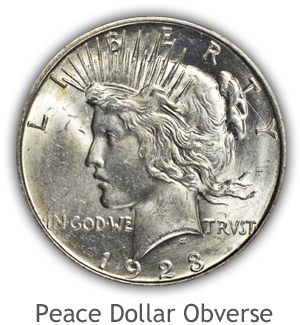 Separate your Peace dollar with collector value from those tied close to silver bullion value. Silver dollars have a complex design, high areas prone to wear and low areas protected from wear. Mint state coins display a complete design, fine details are preserved. Grading involves knowing the completeness of the design to determine if any detail is removed by circulation. Silver dollars in "like new" condition are studied to aid in the grading process. 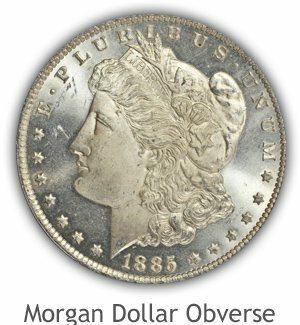 Liberty's portrait fills the obverse of the Morgan silver dollar. Exceptional detail is found within her hair. Waves and curls of hair are accented by the fine line detail within. Above her forehead is highest in profile and considered first when grading. Fine lines at the forehead and near the ear are prone to wear. Liberty's cap features a wreath, two heads of wheat with leaves and two cotton blossoms also with leaves. Wheat ears are finely detailed with fully founded grains as well as the leaves showing central lines. Ribbon above the hair is inscribed with "Liberty" and slightly offset below the hair giving protection. The Liberty cap is textured with contoured folds and bold from the field. Eagle with laurel wreath is highly detailed on the reverse. Feathers are all separated individually and in rows. Breast and neck is high in relief with strong feather detail extending down the legs. Talons are distinct and holding both an olive branch and three arrows. Leaves of the olive branch are fully separated by depth and the branch is rounded in profile. Close inspection of the arrow feathers shows fine detail. Quick to wear are the leaves of the laurel wreath. Each leaf in original mints state condition is higher at the edges and have central lines. Also with high detail is the ribbon bow tying the wreath at the bottom. Two distinct loops to the bow are well separated and the ribbon itself is contoured along its length. Liberty is young in the portrait on the Peace silver dollar. Flowing hair above the eye extends to the neck and trials to the back. Separate strands are features of the hair with finer detail within. One point to consider when grading; detail is often lacking over the ear because of striking weakness. Look to the hair behind the ear to find bold and highly contoured detail. A coronet is above Liberty's brow with spikes extending upwards. Each spike is rounded on a mint state coin. Liberty's hair is loosely knotted at the back. In close-up the knot is well formed and highly detailed. A standing eagle is well detailed on the reverse. Rows of feathers cover the wings. Neck feathers are very bold. A rocky peak below the eagle is full of texture with "Peace" across the front. An olive branch held by the eagle is detailed with leaves high in profile. Stylized sun rays fill the view in front of the eagle. Of note: these rays are slightly rounded in original mint state condition. These old silver dollars already carry a premium to their silver melt value. 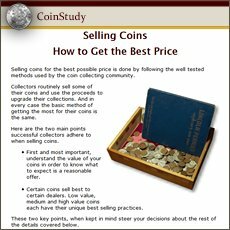 Collector interest in the coins is a strong base to value. A prime focus of collectors of silver dollars are coins in the mint state-uncirculated grade. Popularity of the circulated examples centers on lightly worn examples. It usually is a scarce date and mintmark dollar that is collectable in worn condition. Both Morgan and Peace dollars are worth a second look when found lightly worn. Many dates and mintmarks of worn Morgan silver dollars are collectible and worth a premium. Minimum value today of Morgan dollars 4/22/2019 is $18.09 each. Interestingly this minimum value is for the 1921 date. All other dates are higher in the $18.74 range. It is the "Fine" grade that begins to seriously separate the bullion related dollars into the collector premium category. Grading these coins becomes important if key elements of the design remain. Examine the reverse, if most of the wing feathers are separated, the coin is a candidate to grade Fine or better. 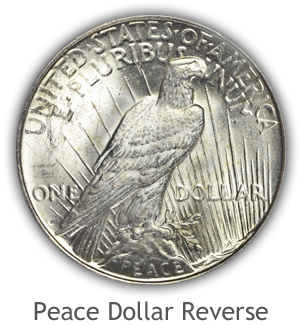 Peace dollars is another series divided by coins traded as bullion silver pieces and others valued as collectibles. Currently, 4/22/2019 the base bullion value is $17.98 for Peace silver dollars. Extremely Fine grade is the true dividing line separating bullion value from premium value. Feather detail to the wing of the eagle is a very good indication to higher grade. Judge the complete wing of the eagle, needed is a separation into rows of feathers from the shoulder of the wing to the tail feathers. Become familiar with grading silver dollars yourself. Review the videos, visualizing the process. 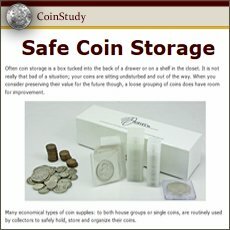 Compare your coins to the reference images. Descriptions highlight areas to judge in determining grade. Video index of how to grade coins. Follow the links to grading coins from Indian Cents to Silver dollars. Each is covered with video, images and descriptions of the grading process. Determine grade to accurately place a value on any coin. 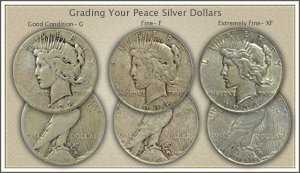 Grading is one of the important parts to silver dollar values. Dates and mint marks identify the coin and grading describes condition. Value charts list the different dollar series by date and mint marks in the different grades with values of each. All US coin values. The different coin series from cents through gold coins are easily found by following the images or text links. Identify your coin and find value charts listing dates and mint marks by grade.